Videocon A52: It sports a WVGA touch display of 5 inches. This device runs on a dual core processor of 1 Giga Hertz. Videocon A52 functions on Android 4.2 Jelly Bean OS. It comes with a RAM of 512MB, internal memory of 4GB and 32GB expandable memory. This smartphone features a 5MP primary camera and a secondary camera of 1.3MP. Videocon A53: It comes with a qHD touch display of 5.3 inches. This device runs on a dual core processor of 1.2 Giga Hertz. 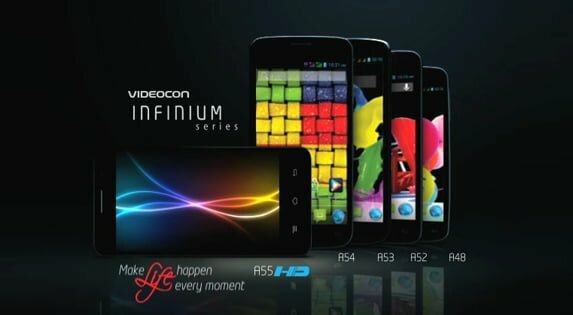 Videocon A53 functions on Android 4.1 Jelly Bean OS. It comes with a RAM of 1GB, internal memory of 4GB and 32GB expandable memory. This smartphone features an 8MP primary camera and a secondary camera of 2MP. Videocon A54: It comes with a qHD touch display of 5.3 inches. This device runs on a quad core processor of 1.2 Giga Hertz. Videocon A54 functions on Android 4.1 Jelly Bean OS. It comes with a RAM of 1GB, internal memory of 4GB and 32GB expandable memory. This smartphone features an 8MP primary camera and a secondary camera of 1.3MP. Videocon A55 qHD: It comes with a qHD touch display of 5 inches. This device runs on a dual core processor of 1.3 Giga Hertz. Videocon A55 qHD functions on Android 4.2 Jelly Bean OS. It comes with a RAM of 1GB, internal memory of 4GB and 32GB expandable memory. This smartphone features an 8MP primary camera and a secondary camera of 1.3MP. Videocon A55 HD: It comes with a HD touch display of 5 inches. This device runs on a quad core processor of 1.2 Giga Hertz. Videocon A55 HD functions on Android 4.2.1 Jelly Bean OS. It comes with a RAM of 1GB, internal memory of 4GB and 32GB expandable memory. This smartphone features an 8MP primary camera with LED flash and a secondary camera of 3.2MP. Videocon A42: It comes with a FWVGA touch display of 4.5 inches. This device runs on a dual core processor of 1.2 Giga Hertz. Videocon A42 functions on Android 4.2.2 Jelly Bean OS. It comes with a RAM of 512MB, internal memory of 4GB and 32GB expandable memory. This smartphone features a 5MP primary camera with LED flash and a secondary camera of 1.3MP. Videocon A48: It comes with a FWVGA IPS touch display of 4.5 inches. This device runs on a dual core processor of 1 Giga Hertz. Videocon A48 functions on Android 4.2.2 Jelly Bean OS. It comes with a RAM of 512MB. This smartphone features a 5MP primary camera with autofocus and a secondary camera of 1.3MP. Videocon A31: It comes with a WVGA IPS touch display of 4 inches. This device runs on a dual core processor of 1.2 Giga Hertz. Videocon A31 functions on Android 4.2.2 Jelly Bean OS. It comes with a RAM of 512MB and 4GB internal storage. This smartphone features a 5MP primary camera with autofocus and a secondary camera of 1.3MP. they should start giving free phones with their other products like AC, TV & WM so people will build some trust on them for mobiles. nice specification. But what about aftersales service ? Will the phone last for more than 6 months ?? ?